I started the day with Lalitha Panchaksaram, Kanakadhara Stothram and then finally Shyamala Dandakam written by Mahakavi Kalidasa. Playing Shyamala Dandakam pleases me as much as singing along to the other two compositions by Adi Shankaracharya. Isn't it great that we sing a prayer written atleast 1500 years ago by the court poet of a famous Gupta King? (Vikramaditya / Chandragupta II) He was part of the golden period in Indian history when our cultural and scientific output was at an all time high. Gau is so frustrated studying history and gets confused between the Mauryas and the Guptas. I have always loved history. I had wanted to study English Literature / History, somehow I am still doing engineering. He (Kalidasa) is probably the only poet that I know of, who was utterly devoted to the Goddess, she was his Ishta Devi. Most saints/poets seem to prefer Rama, Krishna, Devi (Parvati), Muruga, Ganesha and Shiva in that order. My link choice for Shyamala Dandakam is dictated by the perfect pronunciation, not the musical quality. One of the songs I used to teach Ash tamil alphabets, agara mudala ezhuthellam is from the tamil movie Saraswathi Sabatham. They way the first thirukkural has been fitted into the pallavi is so clever no? This song on Saraswathi is one to which Ash hums along. There is an abundance of songs in praise of the Goddess, my favourite was the first Keertane I learn on Saraswathi - Mamavathu in Hindola Raaga. and then Sri Saraswathi Namostute in Aarabhi. My choices are dictated purely by my ability to sing these songs. My mother would make black chana sundal, paruppu payasam, paruppu vadai and appam. She would also say sojji appam is more traditional. I have attempted sojji appam before - it is basically a deep fried, small sized daal poli - and the covering turned a little chewy instead of crisp, I wanted an easier alternative this time and a google search popped up Suyyam. I generally have a tough time deep frying things, but, throwing caution to the winds, I decided this would be what I make. This recipe is more about how to fix blunders in making purnam (the sweet filling) than actually making suyyam. My day had started at 3.30 AM, after 2.5 hours of revising code for a visit to CMC Vellore, I finally soaked the sole cup of chana dal I had to make the sweet filling. Then the blunders started. I decided to cook the kala chana and the chana daal together in my futura - the pressure cooker I bought because it is a work of art and engineering. 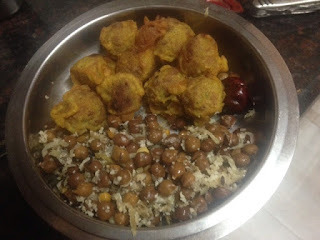 I poured the kala chana into the cooker directly and placed the soaked chana dal in a bowl on the kala chana. 5 minutes of cooking and 15 minutes of cooling later, my dal looked a little watery. I got distracted and forgot to drain the dal, my second blunder. When I returned to cooking an hour or two later the dal had absorbed all the water. I decided to make the purnam by blending the dal, powdered jaggery and coconut together, the third and final blunder. I ended up with something between a kheer (too thick) and a kesari (too thin). I toyed with the idea of offering just the purnam as neivedyam. Then I decided I must fix it. I poured the purnam into a pan on medium heat, added 2 tbspoons of ghee, 1/4 cup more coconut and started frying the mix to make it thick. AFter 5 minutes, I started adding 1 tbspoon of rice flour until the mix started thickening. I must have used about 4 tbspoon. I continued frying until the mix left the sides of the pan. I then set the pan in a bowl of cold water to cool. After cooling I made marble sized balls from the purnam. Mixed turmeric 1/3 cup rice flour and 1/3 cup APF to make a batter. I decided on the water level by dipping the purnam ball in - coat completely but no pooling. Then deep fried and done! The recipe is detailed in Subbu's Kitchen. My changes were a 1/3 more jaggery and 1/4 cup rice flour to the purnam. Add 1 slice of grated green mango (1 side), 1/2 cup of coconut to the cooked Kaala Chana. Heat oil add mustard, once it pops add jeera, red chillies and hing. Soak and cook the chana so that it is just cooked through, not mushy. Drain any excess water. Blend the chana and the jaggery together. Fold in the coconut and the cardamom. Roll into 1" sized balls. Mix the flour together, add water slowly while mixing until you get a pancake like batter. Did each ball in batter and deepfry on medium heat. I am adding this post to Lisa's Vegetarian Kitchen's My Legume Love Affair roundup for the month of Oct 2015. This is the 88th round! Seyyam is deepfried sweet lentils, Sundal is a salad of black chickpeas.